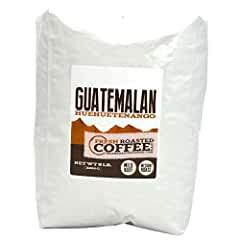 Guatemalan Coffee Brands are considered some of the best gourmet coffee brands in the world. Beans from the finest regions of Guatemala have been found to have the most complex combinations of cupping notes. As we delve into these different regions, we’ll reveal what makes these Guatemalan Coffee Brands so complex, and which names to look for when shopping for the best gourmet coffee beans from Guatemala. Do You Want the BEST Guatemalan Coffee Brand? You might also find that coffee beans from Guatemala are more expensive than what you might expect for a simple bag of coffee beans. There are sometimes reasons for these prices. We’ll dig deeper into those reasons as we look at each of the regions that are known for great coffee beans. During our investigation, we will show you what keywords represent high quality Guatemalan coffee brands. With this new information, you can know what to look for as you travel through life ordering cups of Guatemalan coffee. In our article about Mexican Coffee Brands, we found during our research that the majority of the coffee produced in Mexico comes from a few Mexican states near the southern border of Mexico. So, its no surprise that Guatemala is also able to provide top notch coffee beans. The northern Guatemalan border is right near all of those Mexican coffee plantations. What Guatemala is able to do even better, is to be even further south. This gives Guatemala even better tropical climates. With the mountain ranges from Mexico extending southward, Guatemala gets that rich soil that is full of minerals from volcanic activity. The department of Alta Verapaz has been producing coffee beans since the 1800’s. This Guatemalan department (state) has been growing coffee beans since German settlers arrived in the 19th century. The area also grows sugar cane. The sugar cane gives off a sugary smell that infiltrates the coffee beans which adds to the cupping notes. This state got its name Verapaz from Spanish friars that promoted Christianity to the locals. Verapaz means “True Peace”. The Spanish friars represented themselves as providers of peace during their conversion process. The Alta Verapaz department is covered with mountains. There are also lush areas of vegetation and rain forests that provide shade for several of the shade grown coffee beans. The department of Guatemala also has a deep background in Catholicism. It was also influenced by friars that taught the locals Christianity. In addition to coffee bean plantations, the Guatemala department of Guatemala (the country) was flush with processing cochineal insects into carmine dye. Even today these dyes are used as food coloring and certain cosmetics. One big area of the Department of Guatemala that grows coffee beans is Amatitlán. The town of Amatitlán has created a name for itself as several Guatemalan coffee brands specifically market the Amatitlán name. Coffee beans that fly the Amatitlán brand include Has Bean Coffee beans (from the El Bosque finca), San Gerardo (Typica and Bourbon coffee beans), and El Xalum (a finca owned by Christian Starry). Quetzaltenango produces high quality coffee beans in the SHB (strictly hard bean) category. Strictly Hard Bean refers to coffee beans that are grown at higher altitudes. Typically at altitudes higher than 4,500 feet. The Quetzaltenango area Colomba grows coffee beans around other vegetation like cardamom, macadamia nuts, and bananas. Crops like these that are near coffee bean crops influence the taste of coffee beans. Like most of Latin America, the Department of Retalhuleu proudly hosts a local football club whose name is Juventud Retalteca. The Department of Retalhuleu lines the Pacific coast of Guatemala. Mountains inland from the coast provide an ideal location for coffee bean farming. Retalhuleu as a name in the coffee bean business hasn’t really taken hold. Typically coffee beans from this region just go by “Guatemalan coffee beans”. The Department of Sacatepequez has several areas that grow coffee beans. The local town of Antigua is the most well know by name. 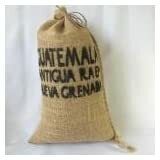 So, if you are looking for coffee beans from this Department, you’ll want to search using the keyword Antigua. Sacatepequez has also been know during its history as Zacatepeques. The southern area of Sacatepequez also produces a fair percentage of the coffee beans (along side of cotton, tobacco and sugar cane) in this Department. The name San Marcos has become synonymous with great Guatemalan coffee brands. Coffee brands wear the term San Marcos as a badge of honor when it comes to coffee beans. San Marcos borders Mexico along the Pacific coast in northwest Guatemala. Towards the northern portion of San Marcos, the Sierra Madre de Chiapas mountain range looms with two volcanos: Tajumulco and Tacaná. The highest peak in Central America is the Tajumulco volcano. Several coffee bean fincas (like Dos Marias) are nestled in the valleys of these mountains. They take advantage of the rich volcanic soil that has evolved over thousands of years. The Department of Sololá is one of the smaller Departments of Guatemala. Water covers the majority of the Sololá Department. The Lago de Atitlán body of water is completely within Sololá. It covers approximately 20% of the Department. The Atitlán name is sometimes marketed as a name of choice for coffee beans because of the richness of the soil. Atitlán is actually more well known than Sololá when it comes to coffee beans. With coffee beans being grown all over Guatemala, there are a lot of differences between the different Guatemalan coffee brands. Our research found these coffee bean to represent the best that Guatemala has to offer. 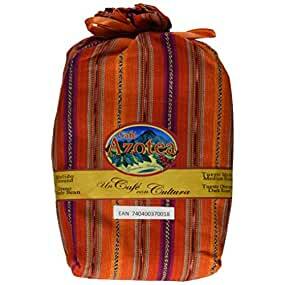 Café Azotea produces coffee beans from a finca in Antigua, Guatemala. The beans are grown under a bio-diversified canopy of shade trees to be bird and animal habitat friendly. Guatemalan farmers process Azotea coffee beans using wet washing techniques. This removes the husks to get to the fruit inside. Afterwards, they are sun dried and dry milled. Workers manually select all of the coffee beans. They pick only the coffee beans that are ready for harvest. They check for quality and uniformity. In addition to the great taste, one thing I love about this product is that it comes in this cool bag. The bag is internally laminated, and comes with a one way valve. The valve releases any gas from the coffee beans (because they are that fresh) to escape. The farm that grows these beans was converted from one of those insect farms that used to be used to produce red dyes. The invention of chemical dyes killed that industry. So, the Orive family converted the farm from insects to coffee beans. These Arabica beans grow at around 5,000 feet. This is right at the sweet spot where coffee beans grow the best. The elevation cools what might be a normally hot climate. And, the mountains shield the sun before the heat becomes too damaging to the plants. The folks at Fresh Roasted Coffee are one of our favorite roasters. This Guatemalan Coffee brand from Huehuetenango has cupping notes that includes cherry, chocolate (towards the darker side), a sprinkle of baking spice, and some woody hints that produces a “fruity” middle and an “earthy” finish. Fresh Roasted Coffee describes this bean as having a mild body and a medium roast. The body description seems on point. Medium roast is appropriate. However, the roast is towards the lighter side of medium. Fresh Roasted Coffee always roasts right before shipping the product to ensure the freshest product. The Smokin’ Beans Coffee Co. produces the coffee beans from the San Marcos Department of Guatemala. From the Finca Nueva Granada, these beans come unroasted to you to allow you to roast to the level you want. Roasters confirm the description from Smokin’ Beans that these coffee beans have cupping notes that include dark chocolate, cinnamon, butter, toasted nuts, and fruity flavors of raisins and lemons. The acidity is bright, but not too much. If you decide to purchase these coffee beans, and you find them to be a little to much on the acidic side, you could try to cold brew them, as that lowers the acidity. During the processing, Smokin’ Beans use fully washed techniques. These beans grow at an elevation of about 5,000 ft, and are SHB (Strictly Hard Bean). These Bourbon coffee tree plants (in this article, the SCAA.org provides more details about the Bourbon variety) are grown using farming practices that adhere to the Rainforest Alliance standards. These include standards that promote sustainable harvesting that doesn’t harm existing eco-systems. This allows the indigenous wildlife to continue to flourish. The large burlap bag that the beans come in is lined with plastic to allow the beans to be stored without oxygen getting to the beans. 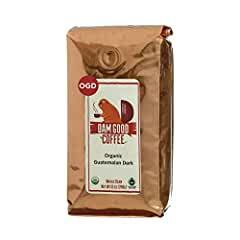 This Guatemalan Coffee brand from Dam Good Coffee is a dark roast. Most find them be deep into the dark regions of roasting that is not really anywhere near medium. Many consider this a medium to full body roasted bean with low acidity. The oiliness of the coffee beans helps to give the coffee made from these beans a lingering feeling on the tongue. To the taste, these Guatemalan coffee beans are smooth and rich. They provide a dark smooth bite with a slightly sweet finish. These beans are organically grown. Dam Good Coffee is buying them using Fair Trade certified business practices. The coffee beans in this Dam Good Coffee product are from the Antigua, Coban and Heuhuetanango regions. We feel like these beans are worth giving a try. They offer a 100% full refund if you try them and decide you don’t like them. So, you can try them at no risk to you. We have reviewed Coffee Bean Direct coffee bean in the past. And, they are often ending up in our top five picks for various categories. One of the reasons that Coffee Bean Direct is successful, is that they strive to roast every bag of coffee beans within 24 hours of shipping. You can alway feel comfortable that freshness is never an issue when ordering CBD beans. Coffee Bean Direct also roasts their beans slowly. They do this to bring out even more of the flavor of the coffee bean. The slow roasting is particularly effective for the dark roasts like this Guatemalan bag of coffee beans. This dark roast is grown in the southern regions of Guatemala at the feet of volcanic mountains. The thousands of years of volcanic activity leaves some of the riches soil for coffee bean farming. This is a tried and true method for producing the highest quality coffee beans. The flavor for these Guatemalan beans is “spicy” with a strong acidic taste (in a good way). Cupping notes that provide a slight caramel finish have also been reported making this an excellent morning or dessert coffee. 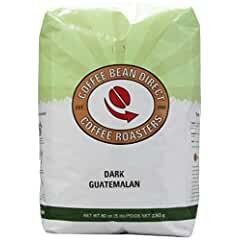 What is clear after a lot of research about Guatemalan coffee brands is that they provide a strong bold taste. Guatemala is covered with mountains. It’s clear that the elevation helps with producing ideal climate conditions for coffee bean farming. And, that old volcanic activity produces extremely rich soils that do wonders for the health and quality of the coffee bean trees. What is also clear is that social awareness has made it to the middle of Central America. Many of the Guatemalan Coffee Brands we found during our research make a point of participating in farming standards that are eco-friendly, animal wildlife friendly, and global warming friendly (participating in roasting techniques that reduces carbon dioxide emissions).